This article is about the course in Super Mario World. For the secret course in Super Mario 64, see Cavern of the Metal Cap. The Green Switch Palace is a small palace found on the west side of the Donut Plains, which is unlocked by finding the secret exit in Donut Plains 2 in the game Super Mario World. Unlike the Yellow Switch Palace, this palace has enemies. This level cannot be replayed after it has been completed. The palace consists of two rooms, which the player has 200 seconds on the Timer to complete. The first room has two levels. 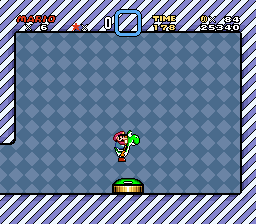 While the player may just use the above platform and take the Warp Pipe to the second room, which has the green ! Switch, there is also the option to hit the P Switch and to defeat the Koopa Troopas on the lower level with a Red Shell. When all Koopas are hit at once, the player gets an extra life. The second room contains nothing except the green ! Switch which can be activated by jumping on it. When the Green Switch is hit, all green Dotted Line Blocks turn to ! Blocks of the same color, which contain Cape Feathers when hit. In later castles, a single green ! 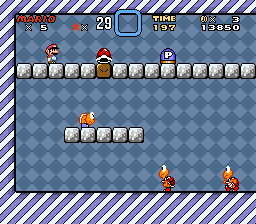 Block often appears before the boss door, giving Mario or Luigi one more power-up before facing a Koopaling. These blocks also help the player progress through the levels by filling in some gaps. The Green ! Blocks only appear in 20 levels after that. This page was last edited on April 5, 2019, at 22:35.